Are you keeping up with the Commodores? Well we are… and HOW! Join us on this, part one of Episode 15, where Jeff waxes on about his very first computer, the Commodore VIC-20. 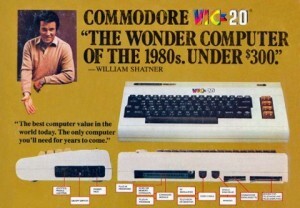 Podcast Episode 15 – Part 1: Commodore VIC-20 was posted on Saturday, April 11th, 2015 at 6:51 pm. This post is tagged and is filed under . You can follow the replies through the comments feed. Pings are closed but you can Leave a comment! A Blueberryware theme › 37 queries in 0.463 seconds.